Copy the LyncDialogListener.msi package to each Lync Server front end and run the installation package on each front end as follows. 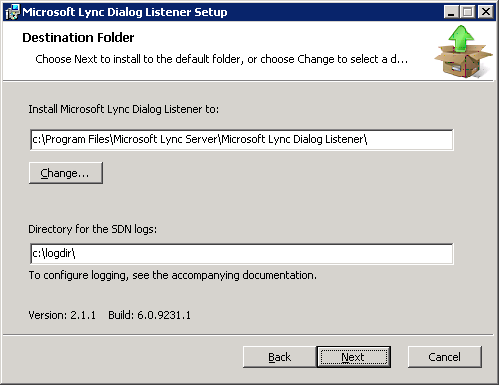 Choose the LyncDialogListener.msi. In the Welcome to the Microsoft Lync Dialog Listener Setup Wizard, choose Next. Accept the End-User License Agreement, and then choose Next. Specify the installation folder or use the default installation path in addition to the location of the application logs. Choose Next. The installer will attempt to locate a DNS SRV record referring to an LSM pool and let you choose this SRV record to connect to the LSM. If you use this option, you might be prompted to specify a client certificate and an account under which the LDL Windows Service should run before continuing the installation. 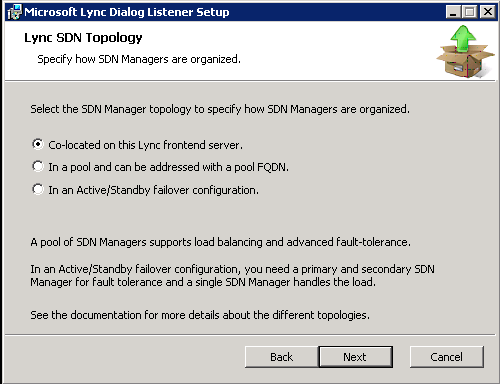 In Lync SDN Topology, select one of the three options and then choose Next. With the first choice, the installer expects the LSM to be installed on the same Lync Server Front-End. In this case, there is no need for mutual TLS and you can skip the next step. Choose the second option to connect the LDL with an LSM pool. Use the third option to configure the LDL to connect to two LSMs, one to be considered the primary and the second the alternative LSM in an Active/Standby failover configuration. With the In a pool and can be addressed with a pool FQDN option, you can choose to use a DNS SRV record to provide the SDN Manager pool URI and choose a certificate for authentication to use the HTTPS protocol. Before installation, this DNS SRV record does not exist. Make sure that you have added this record before LDL can successfully connect to the LSM pool. Alternatively, in the next step, enter the FQDN of the LSM pool that the LDL will connect to. With the In an Active/Standby failover configuration option, set the primary and secondary SDN Manager URIs and select a certificate for authentication to use the HTTPS protocol. 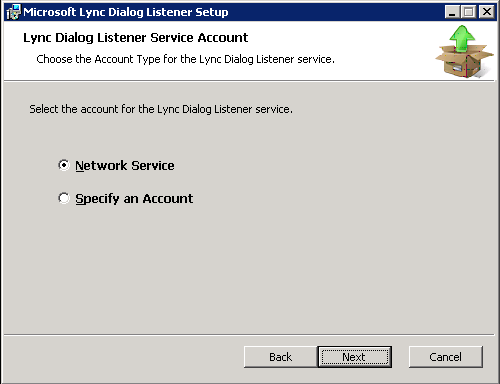 In Lync Dialog Listener Service Account panel, select the Network Service or Specify an Account option, and then select Next. This panel allows you to specify a user account to run the LDL Windows Service or using Network Service. If the LDL service fails to start using Network Service, you may need to change the Windows service definition and specify different credentials. Network Service or the specified user account must be in the RTC Server Applications or RTC Local Administrators local group. In the Ready to install panel, choose the Install button to start the installation. In the wizard completed panel, choose Finish to exit the installation wizard.